It was great to hear from the seven delegates who attended the Committee of the Whole – Budget meeting Thursday (Feb. 7) morning to offer their feedback on the 2019 capital and operating budgets. At Monday’s general Committee of the Whole meeting, we had Delegate James Sisson, who urged committee and council to maintain a city tax increase below 5 per cent. The city is currently proposing a city tax increase of 3.99 per cent for the 2019 operating budget – I am looking to get this budget under 3 per cent for the city portion without compromising what I believe are city-essential services. Remember, there is the Telephone Town Hall on Budget I am hosting tonight (Feb. 7), starting at 7:30. Residents can call in to 1-800-837-8058 to join in and have their say. 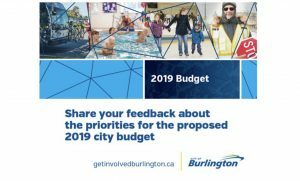 There’s also an in-person Budget Town Hall I am also hosting Monday, Feb. 11 at Burlington Central Arena from 2-3:30 p.m.
Be sure to also check the Upcoming Key 2019 Budget Dates. Hoped council would fund the installation of sidewalk access to Brant Hills Community Centre, agreeing with the suggestion from Committee Chair and Ward 2 Councillor Lisa Kearns that the best location would be off of Brant Street. Echoed the importance of installing sidewalk access to Brant Hills Community Centre, as well as at other facilities local seniors use in an effort to encourage seniors to use facilities outside of dedicated seniors centres and lessen the strain on resources there. I asked Jim for his thoughts about free fare on Mondays, similar to Oakville, and he said BSAC believed free transit on off-peak hours, Monday-Friday, would be more useful for seniors, as opposed to encouraging ridership on one day a week. Chair Kearns asked Jim of the three options in a similar cost-frame – free full-day transit on Mondays to sync with Oakville Transit, free during off-peak hours Monday-Friday, or more paratransit buses – which delivers the best value? To which, he again responded the off-peak free transit option. Spoke on the business case for the new 13,000-square-foot Joseph Brant Museum hopefully set to open in July 2019. The Board is asking for one-time funding of $58K and additional $150K relating to staffing, including a part-time janitor and part-time exhibitors and educators, as well as exhibit coordinators. “We don’t want to be a failure and make the mistakes that have been done historically, previously,” he said. I asked Greg if the exhibit coordinator/educator position could be paid out of revenue from exhibits and he said that would be the hope eventually, but there would be a growth curve as the museum opened. Ward 6 Councillor Angelo Bentivegna asked if staff who worked at the previous Joseph Brant Museum building couldn’t be used to fill these positions and if there was any money from the funding of construction that could be used to pay these new staff? Greg responded the new building is fundamentally different from the previous two historical buildings (Joseph Brant and Ireland House museums). Ward 1 Councillor Kelvin Galbraith asked if there was a business plan for the revenue-generating exhibits? Museums Director Barbara Teatero said there are reports and research they have done and can provide these to committee. She also gave an example of a travelling exhibit in Kitchener, Ont. (similar to what the new museum would bring in) that brought forward about $90,000 in net revenue. 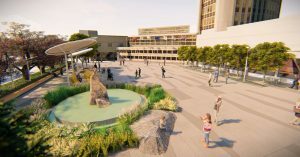 Ward 5 Councillor Paul Sharman asked if it was correct that the situation was one of Museums of Burlington having a brand new business model that was independent of the existing business model and now it was asking the city for more funding to assist the new model – Teatero and DeLazzari agreed. Noted the new council seemed to have a positive outlook on transit and he was pleased to see in the proposed 2019 budget there was an increase to transit in the operating budget and progressive increases including the number of buses, supporting infrastructure, etc., over the next 10 years in the capital budget. “When it comes to fixing transit, the problem has not been staff, it has been inadequate resources. So, we are currently seeing a turnaround. We have a long way to go, but we’re pleased to be on this journey. We’re pleased with budget improvements for transit and that they’re gradual. We’re viewing this in the long-term,” he said. BFAST will once again be hosting their annual transit forum, looking at a May 4 date. Here is a PDF of BFAST’s presentation to budget committee. Noted there was a growing need for a splash pad in the Brant Hills community within walking distance as the number of young families in the area was increasing and the Mountainside splash pad wasn’t accommodating their demand – it has a barrier where the public has to line up to use, if it’s at capacity, which is frequent. Suggested the optimal splash pad didn’t need to be huge, but could include shower and bucket models. 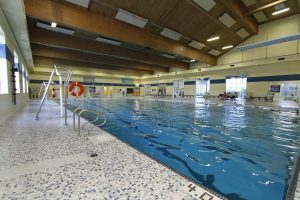 Robillard suggested washroom facilities on site would also be a good idea, but said she rather have a splash pad with no change rooms rather than no splash pad at all. Am I correct in assuming that the Infrastructure Costs ( capital costs) will benefit present and future taxpayers. Should that be the case then why can’t these costs be amortized over a longer period and the funding for the same be accommodated by a City Bond Issue? Well said Penny. I’m with you on the, free and easy handouts of our tax dollars, to areas that should not be at the top of the priority list. There should be responsible people at both the BPA and the Museum that should have to come forward with concrete ideas to balance their books, not just submitting applications for more money!! There are many retirees and unemployed in Burlington receiving no wage increases, so the City’s handling of our money needs to be selectively fine tuned to keep our taxes as close to inflation as possible, or we as citizens will be sliding the slippery slope! I feel that if cuts are needed to be made to reach 2.99% to appease residents then the cuts in services need to be critically examined. Eliminating leaf cleanup or street sweeping is not in my opinion truly budget cuts. I am assuming that employee wages make up the major cost to provide these services. Will these employees be let go or simply moved to another city project? This is not really a cost saving measure. True tax reductions in my mind would be to ask the Burlington Performing Arts to do more than keep coming back each year for close to a million tax dollars. The venue cannot seem to pay for itself solely as a performing arts centre, then it needs to be creative in perhaps becoming a venue for weddings, conventions etc. There is a large open space with bar facilities, cloakroom etc. If the problem is that there is no proper kitchen ( which I thought was very interesting when I saw the venue when it opened) then put one in. This expense will open up options for the venue to be self funding. Free transit for seniors is a nice to have option, but not the answer that will make seniors turn to public transit. More buses, better scheduling and routes is what will convince the public to use transit. Providing free bus service for seniors in my opinion is simply a bandaid that does not address the transit issue. I would rather see the appropriate tax increase now then have to continue to play catchup moving forward.